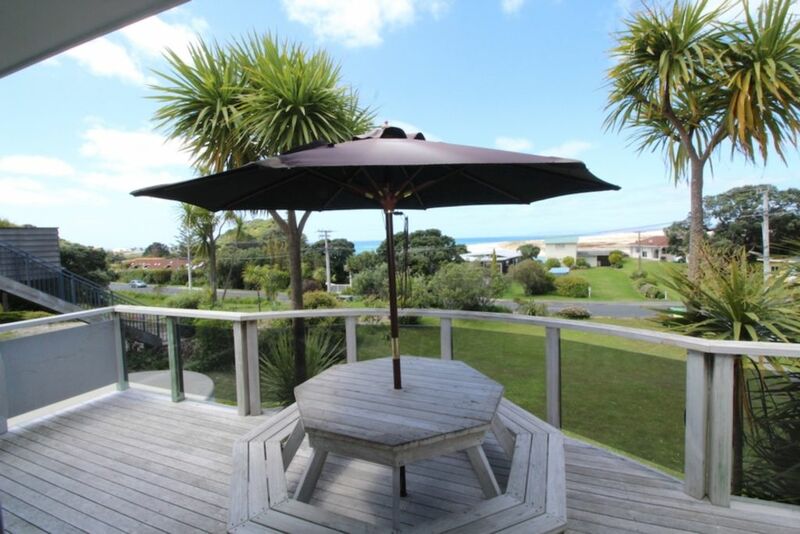 Situated only 400 metres to the surf beach and 200 metres to the gorgeous Picnic Bay sits 'Stone's Throw' holiday home, aptly named as it's only a stone's throw to the beach! Built over 50 years ago but beautifully restored inside and out in the last couple of years, Stone's Throw holiday home offers guests the opportunity to stay in one of the original Mangawhai Heads holiday homes but in style! The lovely modern kitchen and generous open plan living spill out to large decking areas on the front and back of the house. In particular, the rear deck is well sheltered from the sea breeze and is a real sun trap! The views from the house are delightful and easily enjoyed from the large glass frontage or living room windows and even the bi-fold window in the kitchen which opens up fully to let in the breeze if you're in the kitchen cooking in the evening. There is heaps of room to park a boat and the kids will enjoy playing on the large lawn. All of this only a few hundred meters to the beach is hard to find in Mangawhai! Great location to the beach. Lovely property, clean and great amenities. We had a fantastic time and would like to visit again.